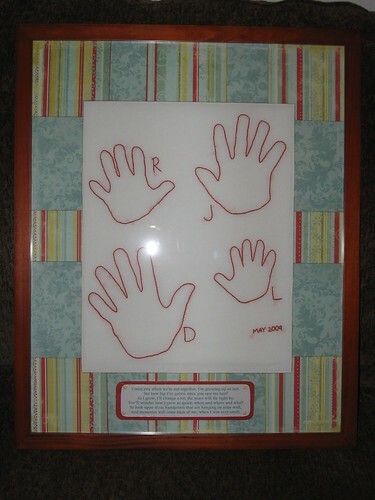 I stitched the hands (my three kiddos plus little cousin Ryan) and Amy found a cute poem and then matted and framed it, and shipped it to Utah in time for Mother's Day. My parents have 13 going on 14 grandkids so I opted to just stitch up my own babies' hands for Mom. 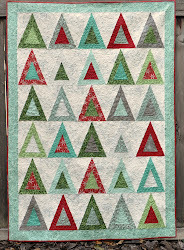 And make it into a quilt. I was LATE getting it done and sent, but that's just how it goes sometimes. This is the cutest idea, Vicki!!! 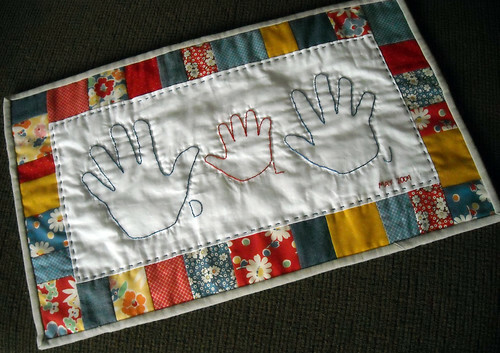 I totally want to make one... but maybe in a few weeks, when I have 6 hands to sew and am settling into a new baby routine. Very cute! What is the poem? Hey-I made it on your blog! That's so exciting! I love what you did for your Mom, too. It looks great!